Heat oven to 350°F (325°F for dark or nonstick pan). Grease or spray bottom and sides of 13x9-inch pan. Make and bake cake as directed on box for 13x9-inch pan. Cool 10 minutes; remove cake from pan to cooling rack. Cool completely, about 1 hour. Refrigerate or freeze cake about 1 hour or until firm. Using serrated knife, cut rounded dome from top of cake to make flat surface; place cake cut side down. Cut cake as shown in diagram. Place cake piece 1 on tray. Arrange pieces 2, 3 and 4 as shown in diagram, trimming to fit, standing up piece 3 for top fin. Trim point of piece 2 for nose of ship. Attach each piece with a small amount of frosting. Spread thin layer of frosting on cake to seal in crumbs. Freeze 30 to 45 minutes to set frosting. Frost cake with remaining frosting. Let frosting set a few minutes. Carefully cover with paper towel and gently pat to give a fabric-like appearance; remove towel. Use fruit snack for strips as shown in photograph. Outline as desired with decorating gel. Store loosely covered. Use this template to make your fun spaceship cake! Create an attractive display by covering a piece of sturdy cardboard with colored foil-coated space-themed wrapping paper, then plastic food wrap. Stretch and secure with tape. Or cover cardboard with foil or cooking parchment paper. Get a party menu, prep guide, tips, party games, activities and more for a Star Gazer Birthday Party! Place strips of waxed paper under corners of unfrosted cake pieces. After frosting, just remove waxed paper strips. No cleanup required! 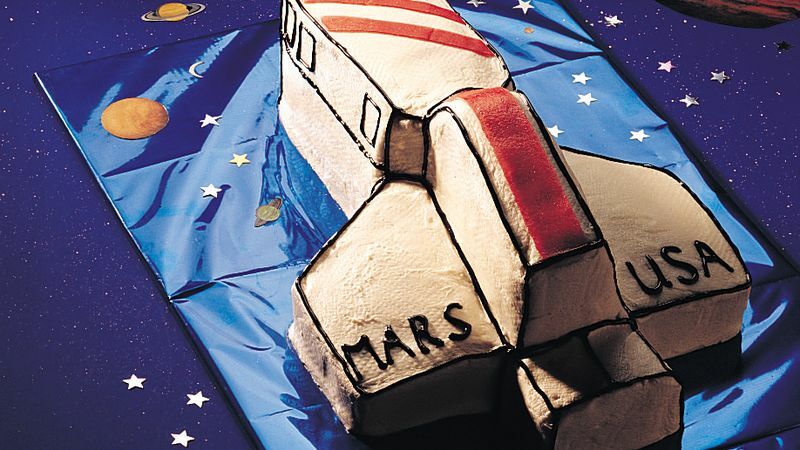 Check out the video for the Space Shuttle Cake. You'll find great tips for this cake's assembly and frosting. Then decorate the cake as shown in this photograph.